Although many types of wood are used in furniture, all woods are not equally durable. Mahogany, for example, is used in a number of luxury furniture and high-end cabinet pieces. Still, despite the wood's luxurious reputation, it is not as hard as maple, which is often used in less expensive pieces. In several, but not all, aspects related to durability maple is the better wood. In the competition for density, maple wins out. Maple is a much more densely packed wood that is both heavier and harder than mahogany. While mahogany features a tighter and thinner grain pattern that makes it harder to cut, maple is hard enough to resist the scuffs and scrapes associated with foot traffic while also retaining an easy workability during construction. Because of this, species such as the rock maple and the sugar maple are often used in flooring and cabinetry. Mahogany is not often used in flooring, but is only hard enough for accent woods such as molding and window trim. Resistance to shock depends upon not only the innate hardness of a wood, but also its ability to bend when required. Maple has a notable shock absorption quality that increases its strength in cabinetry and flooring. Mahogany, while strong, is less shock resistant and may experience damage from sudden shocks such as slammed cabinet doors or falling small distances. The pore size for both maple and mahogany are both uniform. Mahogany has slightly larger pores than maple does. 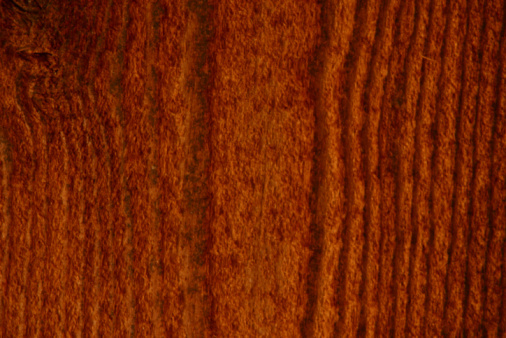 Larger pores give mahogany the ability to absorb stain more readily than maple. Staining helps repel rot as well as protect wood from water and sun damage. Maple absorbs stain almost as well and is often stained to appear like a more expensive wood such as walnut or cherry. Because hardwood is organic, it is open to wood-eating infestations and infections that will eventually rot and decay it. Mahogany wood features a natural resistance to rot and infestation that maple lacks. Because of this, mahogany is often used for deck railings, window trims and other exterior uses. Maple must be treated regularly or painted during outdoor use.